Sorry for the long delay between posts. 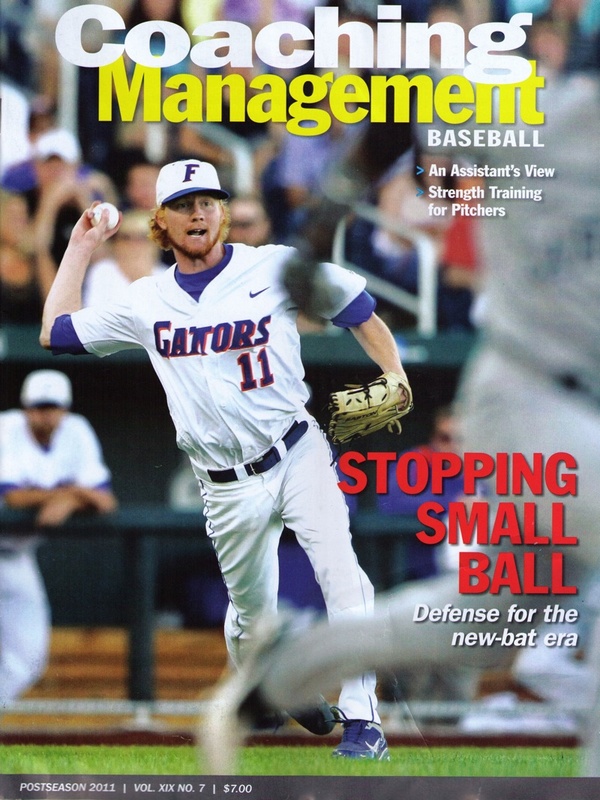 Here is an article that I authored that was included in the most recent Coaching Management (Baseball Edition) Magazine. Look at almost any successful baseball program and you will see a good head coach. Look behind those good head coaches and you will usually see a stable of assistants who work tirelessly to make the program the best it can be. At the same time, though, these assistant coaches are also trying to learn their craft and maybe even climb the coaching ladder. It’s easy for a head coach to take these assistant coaches for granted. After all, a head coach has a roster full of players to think of, and assistant coaches can take care of themselves. But with a little bit of thoughtful care and well-timed words and actions, head coaches can turn their assistant coaches into valuable partners who grow and develop with the program. As a long-time assistant coach who has worked under several head coaches with different approaches and styles, I’d like to share some of my thoughts on how head coaches can help their assistants better help them. Assistant coaches who feel valued are more likely to take the extra steps needed to make the program better, and thus help the head coach look better. Of course, as they develop and grow, some may leave the nest and take over programs of their own, but even this can help a head coach establish a legacy that extends beyond his own program. Every organization has a person at the top—the one who makes the final decision on the most important matters. These are the people held accountable for the organization’s success or failure. In baseball, this is the head coach. He is the one who faces the criticism after a loss or collects the glory after a big victory. However, most head coaches don’t make big decisions by themselves. Each of the head coaches I have worked under had their own way of making decisions. Some valued their assistant coaches’ input more than others, but they all wanted to hear what their assistants had to say. Over my coaching experience, I have found that head coaches who truly consider on their assistants’ feedback and opinions generally make the best decisions. Maybe it’s a matter of two heads being better than one. An assistant coach can see another side of an issue or recognize ramifications that the head coach couldn’t. Often the best solutions were a mix of ideas from the head coach and the assistants. But even when a decision was made that I didn’t agree with, I always felt good if I believed my thoughts mattered. When the head coach listened to what I had to say, I figured they must put some significance into my opinion. Even when they completely disagreed with me, the simple act of listening created an atmosphere of respect. That being said, assistant coaches may need help is seeing things from a head coach’s perspective. Early in my career, a common area of disagreement I had with my head coaches was roster selection. Tryouts are always a tense time for coaches. Working in a cold weather state, like Nebraska, spring baseball tryouts generally took place indoors, which is not optimal environment for properly evaluating players. Nevertheless, we were often forced to make roster cuts based off players’ indoor performances. In addition to sometimes disagreeing on a player’s performance level, I found my basic philosophy to building a roster was in direct conflict with one of my head coaches. This very successful head coach believed in giving older players, especially seniors, the roster spot unless a younger player was clearly better. I, on the other hand, believed in playing younger kids with comparable ability. In retrospect, my preference of playing younger kids instead of the more experienced players was easy to have as an assistant. I wasn’t the one breaking the news to a senior that he didn’t make the team and fielding calls from angry parents. I was oblivious to the fallout of these decisions. Once the head coach explained this to me, I was able to better help him with the preseason selection process. Fair or unfair, coaches are judged by their team’s performance during games. Wins and losses are the measuring stick for head coaches and assistants alike. Although it’s not fair, the best head coaches share the credit, but take all the blame when things go bad. It is not equitable, but it is part of being the leader. One of the easiest ways to turn an assistant coach against you is to criticize him in public. As an assistant coach, I was always appreciative of constructive criticism from my head coaches, and I understood that I would be accountable for any mistakes I made. However, if a criticism was made in public, I would be left with no opportunity to defend my actions or ask questions that would help me learn how to avoid future problems. Head coaches who keep these discussions in private will earn and maintain the respect of their assistants. Those don’t will find themselves regularly looking for new assistants. Conversely, when things go well, head coaches have a golden chance to publicly recognize their assistants. There are several occasions when a head coach I worked for mentioned my name during interviews with the local media, and they still mean a lot to me today. One example occurred when our team performed well offensively. Our hitters banged out 15 hits, including four home runs, against a highly ranked opponent. When talking with a reporter after the game, the head coach explained that I had helped these players develop their swing technique to generate more power and force. Another time while I was working as a pitching coach, our pitchers recorded three consecutive shutouts. In talking about these performances, the head coach emphasized they were due to my instruction and teaching methodology. He stressed my effectiveness as a teacher and thorough knowledge of pitching research and instruction. On both occasions, I was surprised and flattered to see my name mentioned in print. These two examples inspired me to work harder and try to do my job at an even higher level. I also felt a stronger sense of loyalty to the head coach for putting my name out there. It might have just been a few words, but they went a long way to motivate me. However it’s not just dealings with the media that matter. At the high school level, parental criticism is much more likely than media criticism to have an impact on a team or coaching staff. Writers or commentators rarely go after a coach’s job, but parents have been known to run for school board for the sole purpose of having a certain coach fired. In these cases, the head coach and the assistants must stand together. Over the years, several parents have grumbled about my style and instructional methods. Some mentioned my rigid approach on discipline, while others have complained about the demanding practice schedule. To avoid disagreements, it might seem easier for the head coach to just go along with what a parent is saying, but effective head coaches need to combat these arguments head-on so there is no division within the coaching staff. I have no problem answering a head coach’s questions about how I do things, and I will make whatever changes he deems necessary. But I will always support my head coach when parents bring complaints (and believe me, they do) and I expect him to do the same for me. There are stretches of time where coaches spend more time with their teams than they do with their families. But since coaching is only part of our lives, the demands of the family and jobs don’t go away during baseball season. Thus it is important for head coaches to develop personal relationships with their coaching staff. By getting to know their assistants, head coaches can understand what is going on in each coach’s life and how it could affect them. How can managers develop these relationships? First, it is imperative for head coaches to at least know the names of each assistant’s wife and children. Next, there must be a level of understanding about where each coach is in his life. Are they buying a house? Getting their Master’s degree? Going to have a new baby? All of these things, and many more, could impact the assistant’s performance and are important for head coaches to know. Getting together socially is another good way for a staff to develop relationships. When I was a member of one coaching staff, the head coach made sure that our families met the night before the team’s first practice to have dinner together. Since those practices took place early in the morning, it was a nice way to spend the evening before jumping into the season. These dinners gave us a chance to see how each family had changed over the last year. I was sad to see that tradition end as my coaching career changed course. It’s also important to be prepared for life to suddenly get in the way of coaching and be understanding when it does. For example, several years ago, my wife had an emergency appendectomy just as the season started. Being so sudden, I missed several practices due to her surgery. On her second day in the hospital, to my surprise, she received a plant from our head coach. It is hard to express how thankful that small act made my family feel. I know my absence made his job more difficult, but that little gesture showed that he cared about me as a person, not just as a coach. As time moves along, a coaching staff seldom stays the same. As the dynamics of people’s lives change, so do their priorities. Some assistants move on to different positions while others may get out of the business altogether. When these things happen, head coaches must have a plan to fill the void. One of the best ways is by continually developing their assistants coaches and then promoting from within. One natural way to help assistants grow and develop is by increasing their responsibilities as their experience and abilities grow. That way, as the coaching staff naturally turns over, there is a knowledgeable, capable replacement to transition efficiently into a new role. For me, this happened after my third season as an assistant. That’s when my head coach assigned me to create an off-season conditioning schedule and lifting routine. The task required me to research all the possible options and decide which one was best for our team. I had to review and revise the calendar several times before it was implemented. The whole process helped me grow as a coach because it forced me to seek out information and explore new techniques. Also, it required me to be organized and thorough with small details. I remember being very excited and determined to create the best possible system. Successfully completing this project gave me a new confidence in my abilities and helped me as I took on additional responsibilities throughout my career. Why is internal promotion a big deal to an assistant coach, even if it’s a different assistant who gets a promotion? First, it illustrates that the head coach has confidence in their abilities. And, if they perform with an increased level of proficiency, they, too will have the chance to move up to more advanced positions. Not only is an assistant’s motivation level elevated, but it helps to create a professionally rewarding environment. Also, players benefit from continuity of instruction, especially if they have experienced success under a specific coach. If players are continually forced to learn a new system or teaching style when a coach leaves, it may upset their balance and flow of development. This can spell trouble in a baseball where player improvement relies on consistency and repetition. Some assistant coaches enjoy their role and have no desire to become a head coach. Others aspire to run their own program down the line. While it may hurt to lose a trusted and experienced assistant coach, it behooves a head coach to help his assistant achieve his career goals. First, their selection shows that people are impressed with an assistant’s philosophy, motivation, instructional methods, and values. These qualities are seen as a reflection of the head coach and his efforts to develop his assistants’ skills and attitude. The acorn usually doesn’t fall far from the coaching tree and administrators are often drawn to a certain assistant coach because of the head coaches he has worked with. There also comes a point when it’s time for an assistant coach to spread his wings and fly out on his own. He may get restless waiting for his chance to become a head coach. Should he see his head coach as an obstacle instead of a helper in getting a head coaching job, resentment could begin to build. For many head coaches who have watched their assistants move on, it gives them a sense of parental-like pride to know they helped someone reach a career goal. There are several other practical benefits to having assistant coaches move to the next level. First, it helps programs earn respect among its peers by producing leaders. Players and parents are drawn to schools with this type of reputation. It can also help attract accomplished and capable assistants to the program. Assistant coaches talk to each other a lot, and if a head coach has a reputation of leading their assistants to the next level, it is definitely noticed throughout certain circles. Assistants who are looking for work often flock to these types of head coaches. Helping an assistant with his career goals usually means supporting their candidacy for open positions and being willing to support them if they get a new job. However, sometimes the best career advice a head coach can offer an assistant is an honest appraisal of a job opening, even if the assistant doesn’t want to hear it. Sometimes, assistant coaches get a feeling of just wanting to be the head coach somewhere, which leads to looking at jobs anywhere. However, getting stuck in the wrong spot has ruined a lot of coaching careers. When looking at a position, it is easy for aspiring head coaches to view things with rose-colored glasses. Veteran head coaches should give their assistants some straight talk about a program’s reputation and their positive or negative interactions with the school’s administrators. Ultimately, assistant coaches are a reflection of their head coach. Their abilities and skills are dependent upon a head coach taking a personal and professional interest in their development. With that approach, there is a good chance that one day a head coach will look across the diamond to see a former assistant leading his own team and know his legacy will carry on even after he’s done coaching.